Center and Grand Parkway. From here, you can access a variety of recreational and entertainment destinations, as well as the necessities of daily life. Enjoy a quiet evening stroll at Rick Park or put to use your newly refined putting skills at The Club at Falcon Point. We are also close to Christus St. Catherine Hospital and Memorial Hermann Hospital, as well as a variety of physical therapy, chiropractic, and massage clinics to help keep you and your body happy. If you’re a foodie or a proud coffee connoisseur, you’ll love all the delicious treats available in our neighborhood. And don’t forget all the shopping that’s available nearby. Outfit your home, your family, your pets, and yourself within moments of our adult apartment community in Katy, Texas. Everything you need is within reach when you make your home at The Grand Parkway. 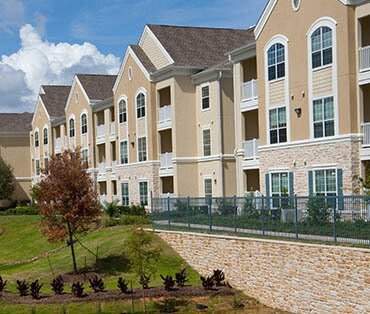 For more information on the many benefits of our 55+ adults-only apartments in Katy, Texas, speak with a member of our leasing team to schedule your personalized tour.